In order to achieve the highest quality hair transplant, you need a combination of in-depth medical knowledge, surgical artistry and skilled hands. This combination creates a reliable opinion on how to best advice on a hair restoration treatment plan best suited to you, the patient. With years of experience in the Medical World Dr Saaed has developed and combined these needed skills and now passionately delivers excellence in hair restoration while specialising in hair transplant surgery. The majority of our treatments are applicable to both men and women. If you are experiencing hair thinning, baldness, thinning eyebrows or scarring, Fortes Medical has the solution for you. There are two methods for Hair transplants, FUE (Follicular Unit Excision) and FUT (Follicular Unit Transplant ). In both procedures Hair from your permanent area is extracted and reinserted into the balding area. The essential difference between the two is ‘How’ the hair grafts are extracted. In FUE individual hair grafts are extracted one by one from the safe donor area. The extraction time here takes 2-3 hours depending on the amount of grafts required. In FUT a strip of skin from the back of the head with healthy hair follicles is surgically excised. This strip is slivered under the microscope by hair technicians into individual hair grafts, later transplanted into the balding area. The extraction time using this method is usually faster than FUE however a thin scar will result after healing with this method. FUE is a surgical method of transplanting hair. Individual grafts are ‘extracted’ out from the donor area of your scalp, and transferred to areas that have no hair (recipient area). At the moment we are able to safely transfer up to 3,500 follicular unit grafts in a single session. This is typically done over one day, but sometimes it is carried over two consecutive days to achieve higher results. Duration may vary from patient to patient. You’ll have a detailed consultation with one of our expert doctors, where all your options are covered. If FUE is the best option, an appointment will be booked for you. If the treatment involves a significant number of grafts, we will have to shave the entire back and sides of the scalp on the day. You will be given a mild sedative and local anaesthetic in both the donor and recipient areas. This is the only real discomfort you feel throughout your treatment. Once the anaesthetic has kicked in, the procedure begins with the extraction of the follicular unit grafts. Manual or motorized extraction methods are used. This entire procedure is clean with a quick recovery time. FUE will leave subtle small round scars. These fine dotted scars will be covered once the shaved hair regrows. We pride ourselves on expert knowledge and meticulous detail in our technique, producing effective results that are natural looking where surgery is virtually unnoticeable. 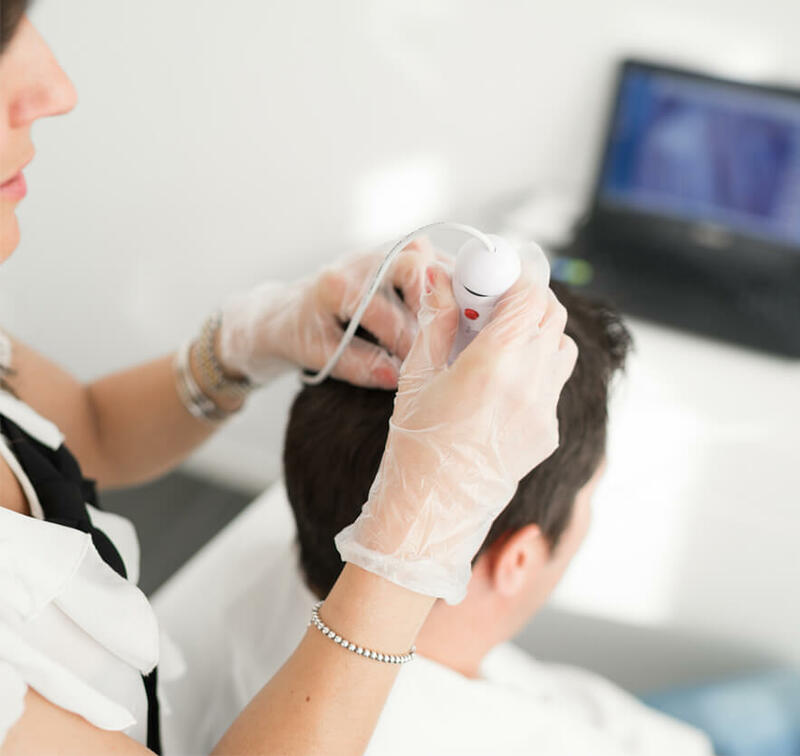 For some patients, where hair loss is at an advanced stage, combining both FUT and FUE allows for the maximum possible number of graft extraction. This combination method also greatly reduces procedure time. Strip FUT is ideal for patients suffering from advanced hair loss who require large amounts of restoration and high graft numbers. Currently, we can restore between 500 to 5000 grafts in one day, and it will take between 4 hours and 12 hours to complete. Come in for a consultation to find out if its best for you. You’ll have a detailed consultation with one of our expert doctors, where all your options are covered. If Strip FUT is the best option, an appointment will be booked for you. You will be given a mild sedative and local anaesthetic in both the donor and recipient areas. This will be the only discomfort you feel throughout your treatment. Once the anaesthetic has had its effect, the procedure begins with the excision of a thin strip from a safe donor area at the back of your scalp. With the aid of microscopes, the strip is then divided into individual follicular unit grafts. At the same time, micro slits are made in the recipient areas of your scalp and, when ready, the follicular unit grafts are individually inserted. The grafts are blended in amongst the thinning or balding areas in such a way as to match all the natural growing characteristics of your original hair. This entire procedure is clean with no bandages or dressings required in most cases. Make sure you’ve made arrangements for someone to collect you. Often you can be on your way home only half an hour after the treatment, but don’t drive yourself. We pride ourselves on expert knowledge and meticulous detail in our technique, which leads us to producing natural looking results where surgery is substantially unnoticeable.